Australia: Not just an island, but a hella scary one too! UPDATE: Australia has crazy-wild spiders. Hey! More cool spiders! Has Kevin seen the light? The coral’s bleaching, the seas are rising and Gaia cries out for aspirin (you know, for the fever), but Keven Rudd promises a tiddly 5% emissions cut to 1990 levels. Cue much wailing and gnashing of teeth. But the message that’s sinking into our politicians is the more realistic one: Australia’s emissions mean nothing on a global scale, the notion that we can influence China and India by forging ahead with our own economic suicide is too far-fetched for serious consideration, and the silver lining to the financial crisis is that it gives governments an excuse to tone down their ETS schemes, which – European countries falling on their collective swords excepted – they seem only too keen to do near the end of one of the most stable decades in recorded climate history. (Addition: Andrew Bolt rightly points out that 5% isn’t 5% at all, since it refers to 1990, not current, levels of emissions. But politically speaking, I still think Rudd’s 5% is about as low as he can go without appearing to be completely giving up on the ETS). On this note, let’s recap the climate change saga: tree-ring proxy data aside (and let’s face it, it’s pointless using a data set influenced as much by CO2 as it is by temperature) most available evidence suggests the Earth’s temperature has been going up and down all the time. In the last couple of hundred years it has, on the whole, been slowly rising, which one would expect following a Little Ice Age. Temperature rose when man-made CO2 concentrations were minuscule compared to today’s, and it rose at roughly the same rate in the first half of the 20th Century as it did in the second half (after an inexplicable 30 year hiatus), and in the 21st Century has been at a virtual standstill. Beginning in the 70’s but coming to fruition in the 80’s was the theory that CO2 concentrations might influence planetary climate, so after about 10 years and 0.2 degrees warming, we were informed of the coming Apocalypse. Rather than admit a paucity of data, woefully incomplete understanding of climate dynamics and need for further research, certain scientists and environmental lobbyists (often one and the same) proclaimed we were facing the end of civilisation as we know it. They set up a *cough* independent panel of *cough* experts to analyse the situation, thereafter waving the figure of 2500 scientists at us whenever their claims were called into question. And yet only a minority of those scientists were actually figuring out how much anthropogenic CO2 contributed to climate change. Many others simply applied the theory to their own fields. Some did not even believe in AGW but their names remained on the list of 2500 nevertheless. Various scenarios were imagined, data extrapolated, best-case and worst-case predictions delivered, with the latter hungrily snaffled up by the media and agenda-driven politicians and interest groups. I’m not about to dismiss out of hand the work of many clever, industrious scientists around the globe. But I will recognise the dissenting voices and try to work out the credible truth that lies somewhere within the media-hyped, over-speculated, Gorified mass of misinformation. Many will admit that worst-case climate scenarios are unlikely but will hold up the precautionary principle as reason for drastic action. It’s a reasonable principle – when it involves little to no harm. Not when it’s guaranteed to wreak its own havoc. Call it a precautionary precautionary principle. Mankind will go nowhere doing everything by the PP. Since every action has a consequence, you can run about predicting possible danger for everything we do. No, we have to use our reason and judgement, which in this case means putting the Gores and Flannerys and FOEs back in their boxes and injecting some realism into the debate. Western civilisation slashing CO2 emissions is going to do next to nothing, even if AGW is real as they say. So get practical. Stop wasting resources. Work on obtaining more reliable temperature readings – dump this flawed surface temp data with recording stations in car parks etc. Argue the real and present environmental threats if that’s your cup of tea, because if Kevin Rudd’s gone all tokenist on AGW, you can bet top dollar he also knows it for the crock it is. 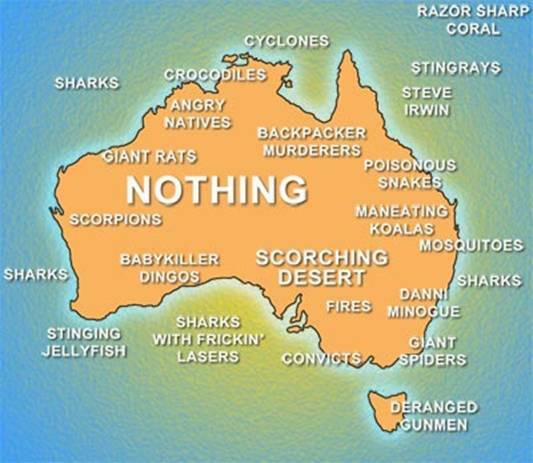 UPDATE 2: More accurate map of Australia here.